"Annual Brahothsavam from 2nd Apr 2019. 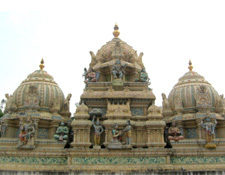 Brahma Rathothsava on 7th Apr 2019"
Sri Prasanna Krishnaswamy Temple situated at Tulasivanam, in the Heart of Bangalore Metropolis, Karnataka, is one of the ancient orthodox temples devoted to Vedic principles. The main Deity SRI PRASANNA KRISHNASWAMY was consecrated in the year 1844 by the predecessors of Mysore Rulers with the trusteeship of Loka Sevakartha Rao Bahadur B.K. Garudachar. 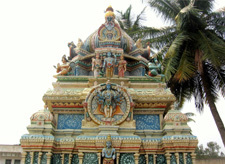 The temple features most importantly Poorva Aacharyaas namely a few Sri Vishwaksenar, Sri Ramanujacharya, Sri Nammalwar, Sri Kaleyan, Sri Vedantha Deshikar, Sri Aadivan Shatakopar, and Sri Thillasthana Swamy. The thirunakshatrams (Birthday) of all Aacharyaas is celebrated regularly. The main deity Sri Prasanna Krishnaswamy as a new born baby, the idol made of Saligrama stone and with a dancing pose is an eye catching feature. All deities in this temple have separate Prakarams. The temple also has a dedicated Paakashaala, Yaagashala, Kalyana Mantapam, exclusive space for Kannadi Arai (Mirror room), Thiru Kalyani. Speciality of the temple: - Of the Dasha Avathara of Lord Sri Mahavishnu, this temple has deities of the 4 Maha Avataras namely Sri Prasanna Krishnaswamy representing SRI KRISHNA AVATAARA of Dwapara Yuga, Sri Lakshmi Nrusimha representing SRI NRUSIMHA of Krita Yuga, Lord Sri Rama representing SRI RAMA AVATAARA of Tretha Yuga and Sri Venkateshwara i.e. SREENIVAASA of the Present Kaliyuga. 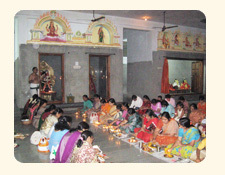 Nitya Aradhana (Daily Pooja) is carried out according to Paancharaatra Aagama. Some of the important sevas in this temple are, Rathothsavam, Ramothsavam, Pavithrothsavam, Shree Jayanthi, Narasimha Jayanthi, Purattasi Maasa Pooja, Thiru Adhyayanothsavam, Vishnu Deepothsavam, Laksha Deepothsavam. Sri Lakshmi Sahasranama Archana, is performed on all Fridays and Amavasyas and is participated by a large number of Sumangalis. In addition Mandalarchana (48 day) is also performed during Aadi masam & Kaarthika Maasa. Pradosha pooja (Abhishekam & Sahasranama Archana) is performed to Lord Sri Lakshmi Narasimha in the evening, during sunset on Two Thrayodashies of each month.